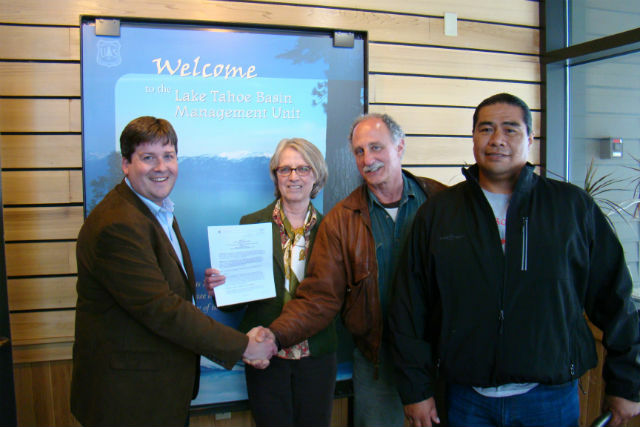 South Lake Tahoe, CA... On Tuesday, February 21, 2017, the U.S. Forest Service Lake Tahoe Basin Management Unit (LTBMU) entered into a partnership agreement with Calaveras Healthy Impact Product Solutions (CHIPS) to serve as a job training site with multiple opportunities for restoration activities on National Forest land within the Lake Tahoe Basin. CHIPS is a non-profit organization based in Amador and Calaveras counties that partners with indigenous groups, such as the Washoe Tribe of Nevada and California, to connect local native community members to their native land through a variety of forest and meadow restoration, watershed stewardship, cultural site work and fuels reduction projects. Left to right: LTBMU Forest Supervisor, Jeff Marsolais and Deputy Forest Supervisor, Teresa McClung, CHIPS Board Chair, Steve Wilensky and Washoe Tribe of Nevada and California Hung-A-Lel-Ti Community Council Chairman, Irvin Jim. Photo credit: Lisa Herron, U.S. Forest Service. Wilensky is for Wilensky and don't doubt it.